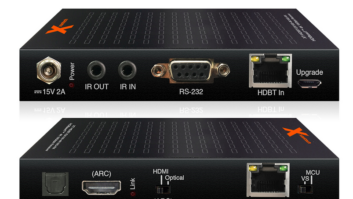 Hansong Technology has made available two new product designs: an entry level HDMI adapter device for transmitting HD surround sound audio and an advanced audio hub device transmitting wireless HD audio from multiple input sources for home theater systems. The adapter device provides basic connectivity through an HDMI port connected to an HDTV for transmitting wireless HD audio to WiSA-compliant speakers. Additionally, the adapter features Bluetooth connectivity for wireless streaming and set up. The wireless audio hub provides multiple connectivity options and audio decoding via HDMI, SPDIF, DLNA and Bluetooth from multiple content sources such as Blu-ray Disc players, HDTVs, set-top-boxes, gaming consoles and hand-held devices such as smartphones and tablets. The audio hub has features that enhance the user experience by providing the ability to control the power on or off, volume, and instantly adjusting the sweet spot as well as selecting input sources through an on screen display or from a handheld device. The audio hub also allows the consumer to stream content from their smartphone or tablet via a WiFi or a Bluetooth connection, giving the consumer more flexibility to listen to content from wherever their content resides. The adapter product is designed to address the legacy TV market with a simple, cost effective solution. Speaker brands can include the adapter with their product offering, giving consumers the choice of buying a 2.1 system today and then scaling up to 7.1 surround sound speakers in the future. The company is offering a complete ready-to-brand hardware solution that can be immediately taken to production or modified according to the customers’ requirement to address a rapidly developing market. The products are based on the advanced U-Nii frequency band and meet the compliance requirement of the WiSA association’s test specification which ensures interoperability between all speakers and CE devices which carry the WiSA compliance logo. “As one of the first advisory board members of the WiSA Association, we are extremely pleased to be able to offer these outstanding products that address the consumers’ desire for a high quality, highly reliable solution that delivers uncompromised surround sound audio for the home theater,” said Helge Kristensen, vice president of Hansong Technology.